The following table lists all the relevant dimensions to help fit your tires and wheels to your Classic Mini. Use this information along with my article that talks you through what you should expect when fitting the three common wheel diameters used for the Classic Mini. **Please note that these dimensions are for bare tires, not mounted or inflated. You should expect slight variations depending on your actual wheel size. For example, the common Yokohama A008 in 165/70-10 may have a slightly different tread contact and diameter when mounted to 10” x 4.5” wheels vs. 10” x 6” wheels. Also note as I stated in the article, there is really not that much difference in overall diameter. All of the tire sizes below vary by only 1.75” in diameter, and the vast majority are well within one inch despite being for 10”, 12” and 13” wheels. Be SURE to consider the WIDTH, as stated in the article, particularly in the front, where extensive bodywork may be required for the increased “scrub radius”. This is definitely a topic that keeps coming up! 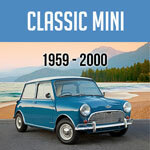 What wheel and tire combinations can be made to fit a Classic Mini? Just a few days ago, had a customer call for “175/55-10” as though they could just be picked off the rack! Hmmm, I’ve never seen such a size, except maybe on a Yamaha Banshee Quad for doing burnouts! I thought it would be a good time to update what combinations are currently available, and a little bit about fitting them to most Minis. It’s been pointed out by me and others, that all the common combinations end up having about the same overall rolling diameter. I did some measuring and comparing sizes in a post on the Mini Mania Forum to show that the most popular 10 inch wheel and tire combination is only about one half inch smaller in overall height than the popular (and really the only!) 13 inch tire that fits a standard-ish Classic Mini. Now that seems to make it sound rather easy to just bolt up what you want, when in fact, very careful set-up is needed to ensure clearance from the body, and safety for brakes and handling. Almost any increase in size will require careful consideration. Is the extra width “inboard” or outward as the popular deep-dish look would result in? Obviously, the former might have the tires contacting the inner fenders during turns, and might require wheel spaces or limiting the steering travel as Rover did with the big wheels of the late 90s. The ‘deep-dish’ look will certainly require clearance be cut in the front fenders in front of the tires as the ‘scrub radius’ will get much wider. Depending on enforcement in your state, and how much you drive in the rain, you may need flares to cover up big tires that stick out too much. Most clearance issues will be with the front wheels, as the only thing you can do for the rear is to be sure you don’t have inside contact and that the car sits high enough to avoid contacting tires that are at all wider than stock. Even when big flares are installed, the rear wheel-arches are seldom trimmed, as loosing the seam results in very flimsy sheet metal. Stiff suspension keeps the amount of deflection in check, and many of us want our cars low enough that we know there is a danger of contact with the body if driven aggressively or with more weight in the car. The dry rear suspension had no bump-stops, relying on the rubber cone spring itself to limit travel. Depending on your set-up (say with coil springs and wide tires), you might consider the aftermarket kit we offer C-SRP015 to protect your investment in tires and paint! 10 INCH WHEELS: Most Classic Minis produces before 1984 came with 3.5" x 10" rims and 145/80-10 tires. This was about the only size that ever fit within the fenders with no flares and not much chance of contact with the body! Ever the Cooper S and 1275GT models had the little tires on 4.5? wide wheels to barely clear the fenders and fit within the spare-tire well. A change to the popular 165/70-10 tires required the (usually Hydrolastic) suspension be in top shape, and most often small flares to contain the tires. Just about any aftermarket wheel would use the wider tires and require the installer to verify clearances, and that means make sure the suspension is up to snuff. For 6? wide wheels, body clearance and some kind of flare is almost always necessary. I like the skateboard look too, but you’ll throw water and road debris all over your car and at anyone nearby! 12 INCH WHEELS: By 1984, the Classic Mini finally got some decent disc brakes as standard across all models. With the bigger rotors and calipers, the standard wheel size had to grow to 12 inches. Many find these Minis with 12 inch steel wheels to look rather clumsy as they were tall and narrow, and the scale of it is not as ‘pleasing to the eye’ as the beloved 10 inch wheels were! Luckily, the aftermarket provides an alternative that might just be the best compromise. The Yokohama A539 in 60 series is just about the same overall height as the 10 inch combinations, fills the wheel openings nicely, and provides a less harsh ride than the 13 inch option which MUST use a 50-series tire. Body mods will likely be required, at least in front, as the tire and the resulting scrub radius are considerably wider. A lower cost tire in the same size is available from Falken. Wheel sizes are either 5" or 6" by 12" for the 165/60-12 tires. Obviously the 5" is much more likely to clear the body, and/or work without flares. 13 INCH WHEELS: Finally, the size many love to hate! 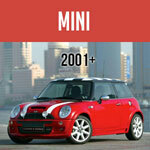 The only commonly available tire for the Mini for 13 inch wheels is the 175/50-13. We stock the Yokohama A539 as well as a lower cost Nankang tire from Taiwan. These tires will reasonably fit wheels from 5 to 7 inches in width, with 6" being ideal. I run the Yokohamas on my own modified 66 Cooper S with 13" by 5" wheels and no flares! Yes they stick out a bit, and yes the front wheel opening has been enlarged to allow the car to sit quite low without hitting the tires as long as I’m reasonably careful. I re-formed and welded the seam to keep the required stiffness of the front wings, and Hi-Los let me quickly raise the car up a bit when my 300 pound brother-in-law wants a ride! Rover offered a 13" by 6" wheel with this tire size as an option for the “Sportpack” model of the late 90s. Those models had larger fender openings, extra ‘stiffeners’ to support the front wings, taller joint knuckles to raise the ride height, limited travel steering racks, AND huge flares to cover the tires! So yes, body modifications are required for just about any 13 inch wheel combination.